When Patrick Kane sprinted down the ice shaking his fists in the air, before even the television cameras had found the game-winning goal sliding into the side of the net, the most spectacular resurrection in the history of professional team sports had taken place. The Chicago Blackhawks are Stanley Cup Champions. Step back for a moment and read that last statement again. The reality of this proposition becoming true made Bobby Hull and Jeremy Roenick cry just like thousands of other Chicagoans that have given their hearts to the franchise for generations. 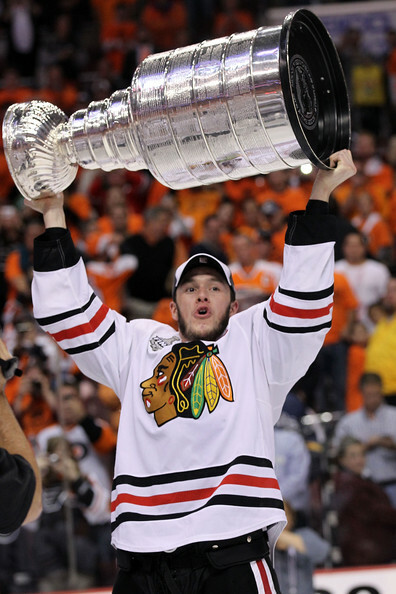 Count me as one of those that needed a tissue when Jonathan Toews hoisted the Cup above his head. Consider where the players on this team have come from. Patrick Sharp and Ben Eager kissed the Cup on the ice surface they weren’t good enough to play on full time; the Flyers dealt both to the Hawks for relatively little return. Tomas Kopecky was Detroit’s leading hitter last year, but they didn’t want to bring him back. New Jersey didn’t invite John Madden back despite the two rings he won with the Devils. Andrew Ladd, once the fourth overall pick in the draft who won a ring with Flyers’ coach Pete Laviolette in Carolina, saw those same Hurricanes give up on him when they dealt him to Chicago. Kris Versteeg, a fifth round draft choice, didn’t factor into Boston’s long-term plans enough for the Bruins to keep him; they must be thrilled with the value they got in Brian Bochenski. Heck, Antti Niemi was too old to even be considered for the league’s top rookie honors; he was never drafted and signed with the Hawks as a free agent at 24 a couple years ago. Indeed, Dustin Byfuglien didn’t do much better with scouts; 244 players were drafted before him. Troy Brouwer was drafted after 213 other players. Niklas Hjalmarsson watched 107 other names get called before the Blackhawks tabbed him on draft day. With the rare exception of guys like Brent Seabrook, Jonathan Toews and Patrick Kane being high draft picks (Duncan Keith was a second round selection), or big-money free agents like Brian Campbell or Marian Hossa, most of the players on this Blackhawks roster are afterthoughts and castaways. Which is perfect for this organization. In the first two seasons after the lockout, the Blackhawks ranked 27th (13,319 avg in 2005-06) and 29th (12,727 avg in 2006-07) in attendance in the NHL. Three years ago, the Blackhawks had the second-worst average attendance in the league. Nobody wanted to watch a terrible team. And the Blackhawks were terrible. In 2003-04, the bottom fell out when the team finished a regular season with 59 points. In fact, before Toews and Kane arrived, the team had just one season in the decade with more than 80 points in a season. 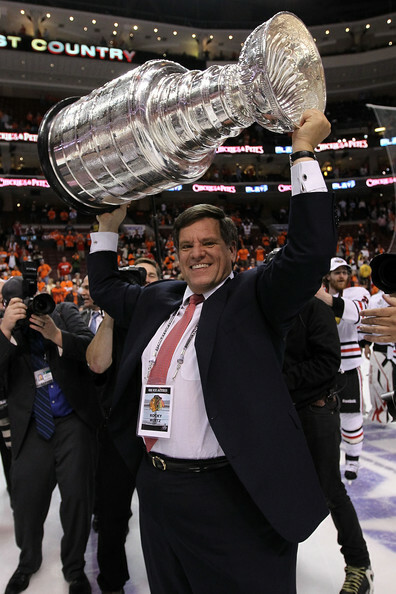 Dale Tallon started to convince free agents to come to the Hawks by grossly overpaying them. At this point in the organization’s history, it wasn’t elite players coming to Chicago, though; we’re talking about Tallon offering way too much money and far too many years to guys like Martin Havlat, Nikolai Khabibulin and Brent Sopel getting long-term deals despite being older, injury prone or having limited skill sets. In the rookie seasons of Toews and Kane, 2007-08, the Blackhawks jumped to 19th in the league (16,814 avg). The team also jumped into a tie for ninth place in the Western Conference with 88 points. It was apparent that the turnaround was starting. In the summer of 2008, the Blackhawks were able to sell their vision to higher-profile free agents like Brian Campbell and Cristobal Huet, but still had to overpay with both dollars and years to get them into the fold. They were also able to sell their vision to the league, and the Commissioner’s office bought in; the Blackhawks were awarded the Winter Classic on New Year’s Day in 2009 at Wrigley Field against the Detroit Red Wings. The team on the ice started to back up the seemingly irrational hope of Rocky Wirtz and John McDonough, and the response was overwhelmingly positive. In attendance, the Blackhawks have ranked first in the NHL each of the last two seasons. But Chicago has seen this before. Since 1961, fans of the Hawks have seen Tony Esposito, Ed Belfour, Steve Larmer, Jeremy Roenick, Chris Chelios, Doug Wilson, Keith Magnusson, Denis Savard and hundreds of other great players wear the Indian head sweater and achieve wonderful personal accolades, but the Stanley Cup hadn’t landed on Chicago’s West side. After the game, when Jeremy Roenick apologized to the kid that was crying when he left the ice at the Chicago Stadium in 1992 after losing to the Pittsburgh Penguins fans, he spoke from his heart on behalf of every one of those great Blackhawks players that never held the Cup in Chicago. This year’s Blackhawks team didn’t have a superstar scoring 50 goals like Savard, Bobby Hull or Stan Mikita. And it didn’t have a god between the pipes like Glen Hall or Esposito. But in this era of expansion, with the talent in the league and the length of the playoffs, the 2009-10 Blackhawks might prove to be the best team in the organization’s history. Tallon did a magnificent job of putting together a roster with perfect complimentary pieces. The way the organization has developed players like Keith, Seabrook and Hjalmarsson into elite defensemen is a credit to management, and the faith the team put in their young stars Kane and Toews to stick with them through injuries and a rough first season with many highs and lows showed patience most major market sports teams cannot imagine. 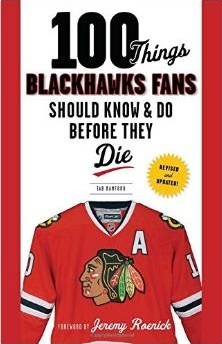 Within the last decade, the Blackhawks have been ranked the worst professional sports team in North America by Fortune Magazine, a distinction that usually carries decades of miserable play. And yet while the LA Clippers and Baltimore Orioles of the world continue to wonder if/when they’ll be able to develop a fighting chance at legitimacy, the Blackhawks have climbed all the way to the top. Hey I was wondering if you had or knew where to get a larger size image of the team photo in the first part of the article. I’m redoing my den and would love to get one of the shots from the on ice team photos framed and on the wall but all the photos I seem to be able to find are no bigger than 650×450. Thanks. 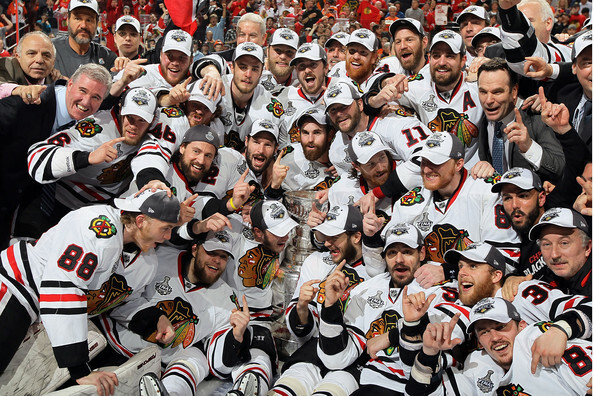 ← Chicago Blackhawks – Stanley Cup Champions!